I haven’t had to wear a Halloween costume for years, and I liked it that way! (I know, I’m a spoil sport.) But this year, as a preschool teacher, I needed to come up with a costume for our class party. I had an old denim shirt in my closet and thought maybe I could whip something up. (October is turning out to be a crafty month for me!) I looked around the house for a flannel shirt I could cut up, but I didn’t like the colors I found. 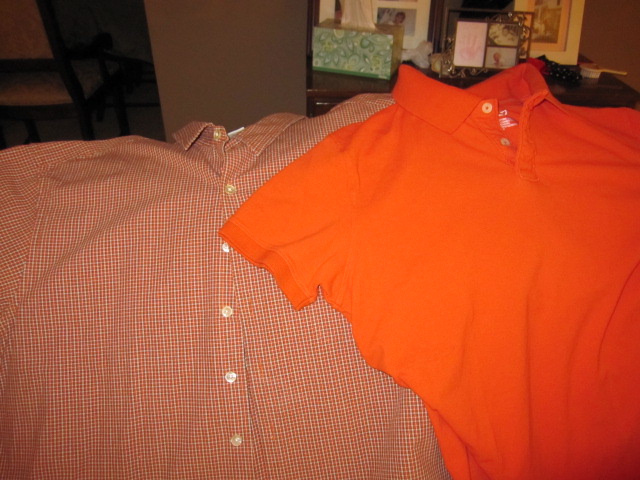 So I took a trip to Good Will, and found two orange shirts which cost $2.99 each. 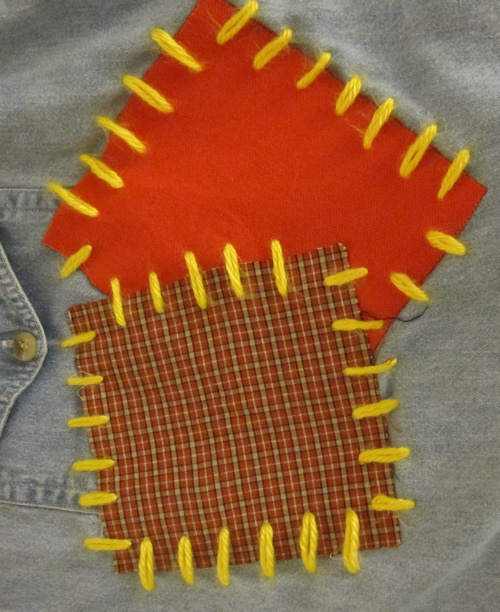 I cut some “patches” from the shirts, and using iron-on adhesive, I attached the patches onto the denim shirt and an old pair of jeans. Using some yellow yarn from the yarn stash I inherited from Mom, I stitched some large stitches onto the patches. 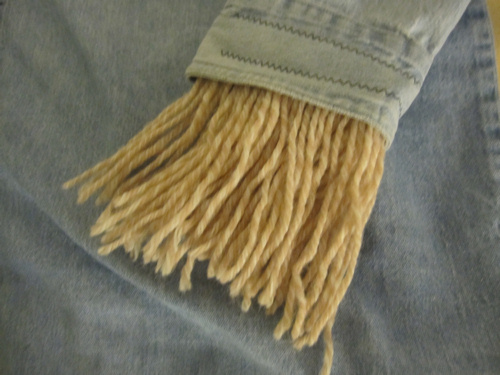 Using a more straw-colored yarn, I sewed “straw” to the shirt’s cuffs. 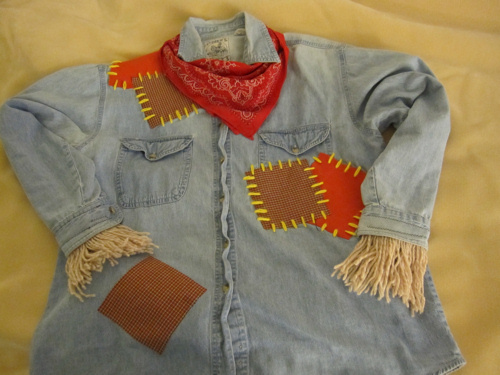 Add a red bandana from my top dresser drawer, and I had a scarecrow costume! As a preschool teacher, I don’t wear make-up or masks because some little ones would be scared or get nervous to see their teacher look completely different on Halloween. They notice when I wear different glasses to school! If you would like to add make-up to your scarecrow costume, here’s a great tutorial: Scarecrow Make-up Tutorial. I also used my Good Will purchase for another craft! Click here to see how to make Halloween Jack o’ Lantern Jars! Are you looking for easy Halloween crafts for the kids? Here’s four you can do today: 4 Easy Halloween Crafts. Great costume! I made scarecrow costume last year. This year he wants to be a pirate.Thank you so much for stopping by on my SITS Day and leaving me a sweet comment. I appreciate it very much. That is a great idea. It really turned out perfect. Have fun!